Amid reports of a ho-hum holiday season, you really have to wonder about current consumer mindset. After a strong turnout Black Friday weekend, Hurricane Sandy hit, we witnessed tragedy in Sandy Hook, while those on Capitol Hill literally left us hanging on the fiscal cliff. Retailers continued to give consumers what they really wanted – deals, deals, and more deals – but ultimately it appears that practicality and a focus on needs were at the forefront of consumers’ thoughts as we approached December 25. To top everything off, NBC revealed record ratings for its Christmas Eve showing of It’s a Wonderful Life…coincidence? Perhaps not. Football: America’s new favorite pastime? With its top ten ranking, the NFL is certainly giving Major League Baseball (Apr-12, #46) a run for its money. The Giants-Patriots match-up for Super Bowl XLVI (Jan-12, #19) finished within the top 20 this year; however, it was the Packers-Steelers bout in Super Bowl XLV that took top honors in this list back in 2011. At #9, Apple’s third iteration of its popular iPad was the top tech gadget we polled in 2012, while the more recent releases of the Apple iPad Mini (Nov-12, #25) and Kindle Fire HD (Oct-12, #27) – which sparked the great tablet debate – ranked lower in our list overall. Fresh off of 2011’s royal wedding, the British invasion of sorts continued for Americans in 2012 with the London Olympic Games. Ranking higher than any other athletes on our lists, swimming superstars Michael Phelps (Aug-12, #21) and Ryan Lochte (Aug-12, #36) proved that they were certainly the pride of the yanks. Perhaps it’s because they offer fresh fare or maybe it’s their “shop small” charm, but at #7, Farmers’ Markets were hit among consumers getting back to the basics this year, though Community Gardens (Aug-12, #81) and Gluten-free Diets (Jul-12, #106) didn’t rank quite so highly. While those of us residing in the swing states couldn’t wait for the endless barrage of phone calls, mailers, and commercials to end, this year’s Presidential Election was certainly very important to all who exercised their right to vote. Indicative of a consumer group prioritizing budgeting, practicality, and – most importantly – saving money, Coupons scored a top five position in this year’s list. 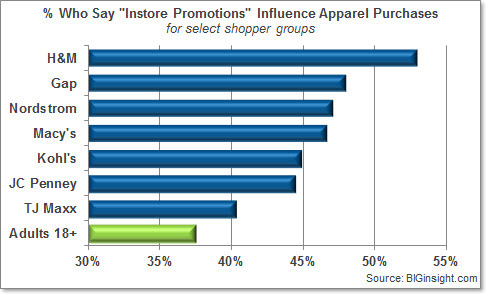 Note to retailers and manufacturers: keep ‘em coming in 2013. You lose your right to complain when you don’t exercise your right to vote…right? Whether their candidate won or lost the election, Americans set precedence on voicing their opinions this year. Arguably one of the few bright spots for retailers over the past holiday season (gift cards were pretty popular as well), shopping online – whether via a traditional computer/laptop or a mobile device – just clicked with consumers this year. With free shipping offers abound, gift givers were able to skip crowded malls, long checkout lines, and stock-outs in favor of cruising the web for the big bargains, competitive pricing, and compelling customer reviews from the comfort of their couches. However, with Holiday Shopping in Stores (Dec-12) landing at #15, it appears that plenty of Santas still preferred to shop the old fashioned way. While the Black Friday shopping tradition is increasingly encroaching on the fourth Thursday of November, consumers are seemingly taking a stand on the Thanksgiving holiday, placing it atop our list this year. (Giving Thanks was #2 last year.) It’s a Wonderful Life, right? * The month/year each item was asked is denoted in parenthesis (MMM-YY). Advertising Circulars are the top media among all generations, except for those Gen Y-ers. Among these youngsters, Coupon Websites (35.0%) are the most sought-out, followed by Ad Circulars (33.5%), TV Advertising (33.1%), Facebook (32.3%), and Emails from Retailers (31.4%). 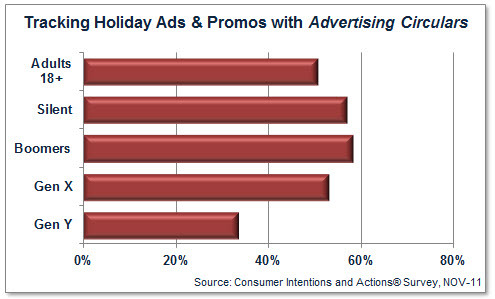 As you may expect, Ad Circulars are the most popular among the Silent generation (56.8%) as well as Boomers (58.1%). These two generations also place Direct Mail in the their top five lists. The importance of social media grows as generations decrease in age. 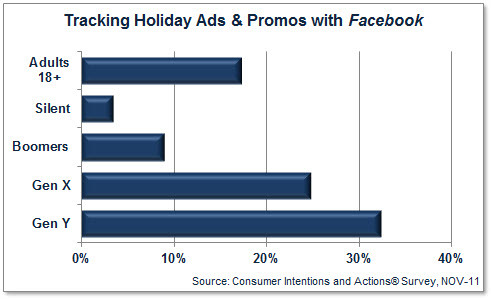 As previously mentioned, Facebook (32.3%) is a top five ad source among Gen Y; additionally, about one in four (24.7%) Gen X-ers socially engage this site for holiday promotions. Far fewer Silents (3.4%) or Boomers (8.9%) are doing the same. Among the younger generations, blogs are more popular as well. 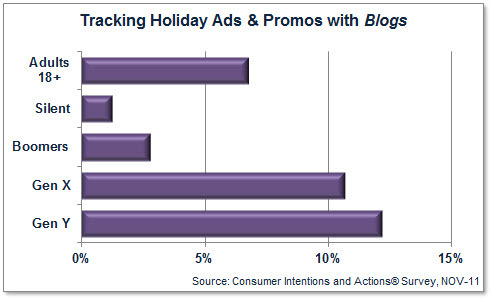 About one in ten of those in Gen X (10.6%) and Gen Y (12.1%) admits to scanning blogs for access to holiday deals, while this method is much less likely to be employed by Boomers or Silents. It doesn’t appear that holiday shoppers are giving too much attention to Twitter this year. While many may be tweeting about the purchases they make or the deals that they scored, this was among the least popular venues for consumers to find holiday sales and promotions. Just 6.0% of Gen Y-ers rely on Twitter, and this percentage drops precipitously with age. One of the media newcomers, Group Buying Websites (i.e. 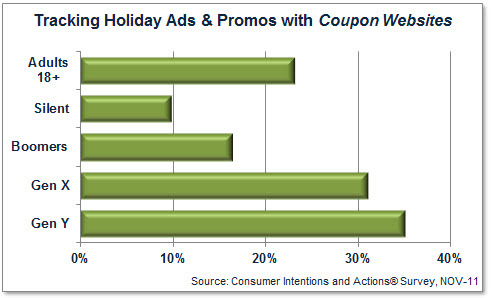 Groupon, LivingSocial), is gaining fans with the younger generations. Among both Gen X and Gen Y, about 15% are intrigued by the mega deals offered through these venues. About one in ten Boomers are buying in, while just 5.3% of the Silents are tempted. 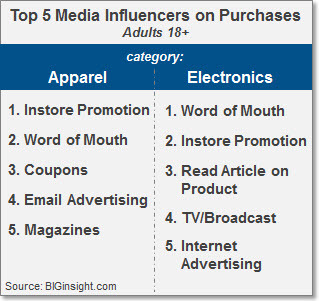 Besides the fact that younger generations prove to be more receptive to newer forms of media, this data really tells us that retailers need to know who their customers are in order to reach them in the most effective manner this holiday season…BIGinsight consumer data, anyone? For more information on this data, please contact BIGinsight™.